Saturday: yet another instance where several pilots had extraordinary flights and I was back on the ground in under 30 minutes. At one point in the afternoon, the club had 9 gliders and 2 tow planes simultaneously aloft. I took off around 1 pm, released from tow over the ridge, and hooked up with good lift. The Grob 103 was flying elongated patterns in the strongest lift over the rocks. I had an interesting time keeping the 1-36 in a safe opposing position while also remaining within the thermal. After circling and porpoising for a few minutes I turned toward Linden, bent on flying triangles around the airport despite seeing few promising clouds within reach in that direction. I left the thermal slightly above 4,000 feet MSL and felt the giant invisible hand mash the glider down. About 4 nautical miles later, the altimeter read 2,200 feet MSL. The house thermal didn't seem to be working. A gamble on a nearby "wispy" didn't pay off. I found some disorganized bubbles of lift north of the airport and made repeated passes through it. The net result was a very slow descent rather than a climb, and soon I was back at pattern altitude. A re-light wasn't possible as there were two people queued up for the glider and an electrical problem with the Pawnee's TOST reel later put an end to operations in the afternoon. Though humbling, it was good experience and I was happy just to get into the air. I'll be sure to top out the thermal next time before heading off through known sink. Someone warned me later that my chosen turn point southeast of the airport is in an area where the thermals are historically spotty. On Sunday, I took two more practice flights in the back seat of the K-21. I was signed off a few weeks ago to give rides with the passenger in the front seat--allowing them a much better view--but I wanted another opportunity to get more comfortable with the obstructed view and sight picture. I learned a new trick to flying the tow: cheat over a little to the left, then look to the right of the passenger's head. The small offset to the left helps with visibility but also counteracts some of the tow plane's left turning tendency; the tow pilot will need a bit less right rudder as a result. The first flight was a bit sloppy and I skidded through a few of the turns. The rear yaw string is above eye level. I wasn't scanning it often enough and my feet seemed to be calibrated to the Sprite. I have no excuse for the nose drop during the first steep turn series. And I wound up over-modulating the spoilers during the approach. 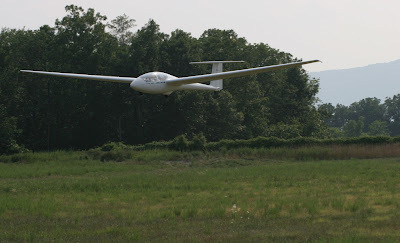 The second flight was a 1,000 ft. pattern tow which felt a lot better, ending in a proper half-spoiler approach.